Welcom to the Web Site of jidoshaseibishi.com(The auto mechanic.com). The auto mechanic.com is a site to support so that the test taker passes a written test in Japan. 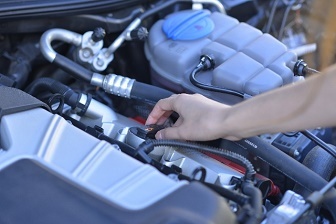 An auto mechanic is a mechanic who specializes in automobile maintenance, repair, and sometimes modification. An auto mechanic is usually called a mechanic and a service mechanic in Japan. Most auto mechanics are MLIT(Ministry of Land, Infrastructure and Transport) certified, which is a standardized method of testing skill level. National test of an auto mechanic does not have a nationality condition, and anyone can challenge a test in Japan. People of various countries is certified but the test problem is described Japanese. Upon providing proof of one year of relevant work experience and after passing at least one exam , the test taker becomes MLIT certified. Written tests are conducted twice a year, in the spring and fall at 53 locations around the country. A person interested in an auto mechanic is exempted the one-year work experience by entering a certified college. It is certified eternally in Japan because an auto mechanic does not be an update exam. Certification grants you professional credentials. Since it recognizes your individual accomplishments, MLIT's certification serves as an impartial, third-party endorsement of your knowledge and experience on a national, even international basis. Thanks for stopping by and getting to know Auto mechanic of Japan. 일본에는 자동차 정비사라고 하는 국가 자격이 있습니다. 수험 자격에 국적 조건이 없기 때문에 누구라도 수험할 수 있는 국가에서 많은 나라의 사람이 취득하고 있습니다. 국토 교통성에 인정된 대학에 입학하면 실무 경험이 면제되어 필기 시험에 합격하면 합격증을 얻을 수 있습니다. 자동차 정비사의 시험은 엔진샤시트란스밋션스테아링 전자 제어 환경 법령 등 폭넓은 문제가 출제합니다. 자동차 정비사는 면허의 갱신 제도가 없기 때문에 영원히 유효한 자격입니다. 일본의 정비 공장에서는 법령에 정해진 자동차 정비사가 있지 않으면 안됩니다. 그러나 딜러의 대부분의 자동차 정비사는 국가 자격을 가지고 있습니다. 자격 취득은, 자기 자신의 지식이나 기술을 높입니다. 일본의 자동차 정비사에게 흥미를 가져 승부에서 이기는 일 감사합니다. Copyright (C) Since 2003 自動車整備士.com All Rights Reserved.